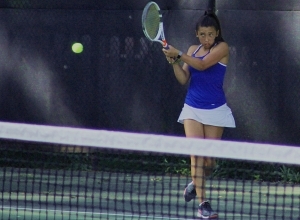 The Chamblee Lady Bulldogs sealed a return trip to the Class 5A Girls’ State Tennis Championship on Monday at Chamblee with a 3-2 victory over the Buford Wolves. The match was already clinched by a 6-0, 6-0 victory at No. 3 singles by freshman Neena Katauskas who improved to 14-0 in singles play this season. Katauskas entered the court with Chamblee leading 2-0 and easily defeated Buford’s Callie Perkins in straight sets to clinch the defending champs return to the state title match. Senior Olena Bulikha and junior Madeline Meer improved to 10-0 as a pair with a relatively easy 6-1, 6-3 over Buford’s Kenzie Harms and Sydney Grothe at No. 1 doubles. The only slip was losing back-to-back games while up one set to none and 4-1. A break on the Buford team’s serve and a win of Meer’s serve closed out the set for the 1-0 Chamblee advantage with the No. 1 and No. 2 doubles still on court. Junior Grace Pietkiewicz ran her record to 14-1 on the season with 6-2, 6-0 victory over Buford’s Kenzie Walters to make it 2-0 in favor of the Bulldogs. The played out the No. 1 singles with Buford’s Alex Mann winning 6-0, 6-4 over Chamblee’s Madison Trinh. Trinh fell to 11-2 on the season but rallied from a 4-0 deficit to within 4-5 before Mann was able to close out the match while serving for the win. Buford (15-7) won the No. 2 doubles point as Ainsley Keller and Kennedy DeLoach staved off a third set with a 6-1, 7-6 victory over Emilya Ershtein and Lila David. Chamblee faces off with the Kell Longhorns (17-3) which is coming off a 3-2 win over Flowery Branch as the two teams eliminated the top two seeds from Region to set up the title match. Kell defeated in order Johnson (Gainesville) 5-0, Grady 3-0, Starr’s Miller 4-0 and Flowery Branch. The Bulldogs hold playoff wins of 5-0 over Decatur, 3-2 over Carrollton (the Region 6 runner-up to Kell), 3-0 over Bainbridge and Buford. Kell split a pair of 3-2 decisions with Carrollton. Chamblee and Kell have split two playoff matches over the years with each winning once. Chamblee defeated Kell 3-2 in the semifinals last season while Kell won a 3-2 decision during first round play in 2012. 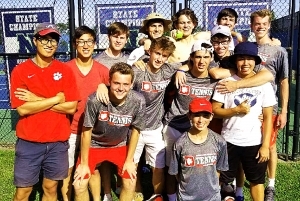 Chamblee is joined on state title day by the Dunwoody Wildcats who reached the Class 6A Boys’ State Championship with a 3-1 win over Northview in the all-Region 7-6A semifinals. The Wildcats are 0-2 against Johns Creek in the state playoffs including losses in the 2011 Sweet 16 and 2012 Elite 8. Dunwoody defeated Winder-Barrow 5-0, Harrison 3-0, Glynn Academy 3-0 and Northview to reach the championship match. Junior Cole Brainard leads the Wildcats into the state finals with a 9-2 mark on the season at No. 1 singles while junior Cade Lautenbacher is 10-4 at No. 2 singles. The No. 1 doubles duo of senior Matthew Moussouri and freshman Quinn Wicklund are 13-3 on the season. John’s Creek defeated in order Apalachee 3-0, River Ridge 3-0, Lakeside Evans 4-0 and Centennial to reach the state finals. The GHSA Tennis State Championships are being held at the Rome Tennis Center at Berry College (100 Match Point Way) in Rome this spring. All girls’ classifications will warmup at 9:00 am with all matches to start at 10:00 am. All boys’ classifications first serve is set for 2:00 pm.